At least 331 million packages were handled by Chinese postal and courier companies on Saturday's Singles' Day, 31.5% more than the same day last year. Employees work at a distribution center of Express Mail Service in Hengyang City, central China's Hunan province, Nov. 12, 2017. Courier companies were running at full speed to deliver massive number of parcels after Alibaba Group's 11.11 Singles' Day global online shopping spree on Nov. 11. 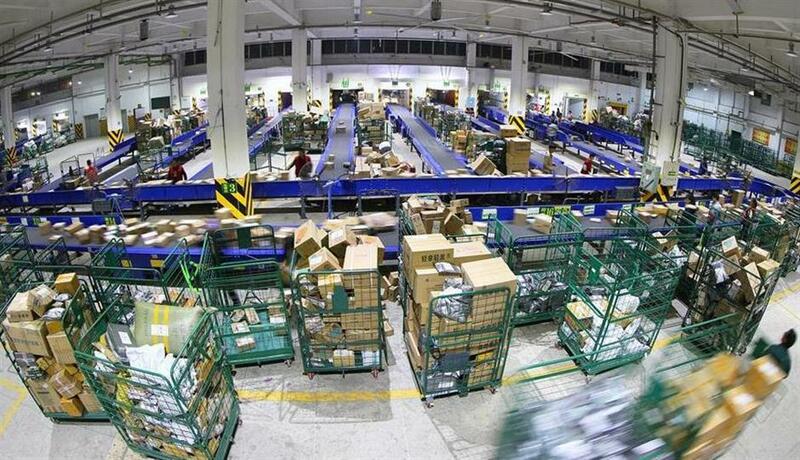 At least 331 million packages were handled by Chinese postal and courier companies on Saturday's Singles' Day, 31.5 percent more than the same day last year, the State Post Bureau (SPB) said. The number represents only some of the 850 million orders placed on Saturday, 29.4 percent more than last year, according to the SPB. China's Singles' Day, Nov. 11, became an online shopping event in 2009 when Alibaba's TMall began promotions. Alibaba's sales this year hit 168.3 billion yuan (about 25.4 billion U.S. dollars), up from 120 billion yuan from 2016. JD.com, who started promotions at the beginning of this month, reported 127.1 billion yuan of orders. Singles' Day is a challenge for the logistics sector in both order volume and service quality, said Liu Jun, SPB deputy director. The SPB expects the number of packages handled between Nov. 11 and 16 to hit 1.5 billion, up 35 percent. Daily volume could be as much as three times the usual level.